This is my contribution to Polish Hoarder Disorder's Song Inspiration Challenge. 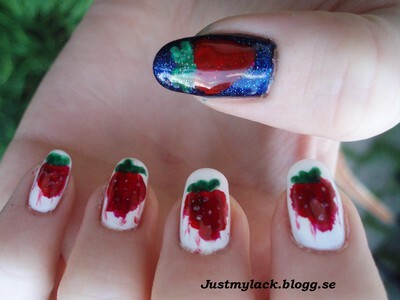 I chose Strawberry Fields Forever by the Beatles because it is one of my favorite songs and I just love the Across the Universe version of it where Jude pins strawberries onto a white paper. The thumb is my version of the cover of the Across the Universe DVD. For the blue on the thumb I used Alix Avien nr. 187. The white on the other nails is Alix Avien nr 60. On the strawberries the Red is Alix Avien nr. 191, the Green is a Franken and the seeds were made with Viva La Diva nr 035. 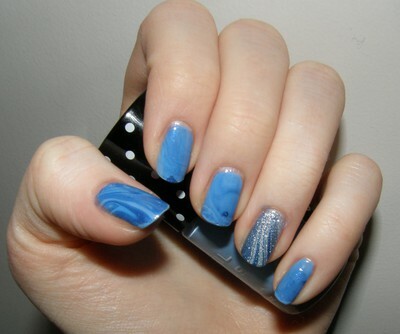 This is a quick manicure I did yesterday using my new Isadora Graffiti nail polish. It is a top coat that crackles into patterns. 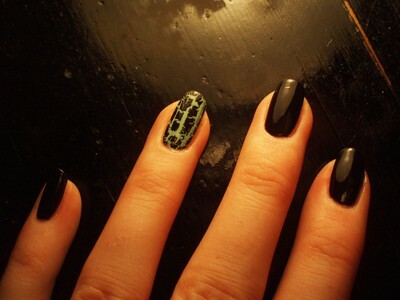 I think it is a good way to get an unusual manicure when you don’t have a lot of time. 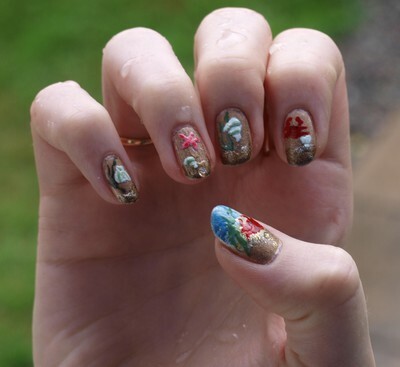 Graffiti nails dries quickly and if you apply a thinner layer you will get more cracks. It is best to use another topcoat over Graffiti nails since it dries matte and will start to chip really quickly otherwise. On my ring finger I used Isadora Vintage mint 619 under Isadora Graffiti Black Tag 801 and on the other nails I used FlorMar Supershine 40. I also enterd Polish Hoarder Disorder's challenge this week and I will post my entry tomorrow. This is my entry to the There's No Place Like Home challenge at The Daily Nail. The reason I chose this motif is simply that I feel at home in the water. I spend almost every summer at the seaside and I was a competitive swimmer from the time I was five until I was about 15 when I had to stop because of an injury. I love everything about water and this is kind of a tribute to the sea! 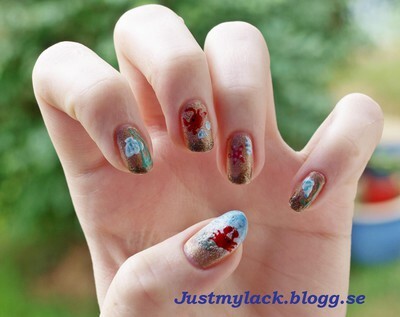 This blog is dedicated to my love of nail polish and my recent interest in Nail Art. I will begin by posting my very first attempt to do water marbling. I wanted a subtle effect that you don't notice right away and I think it went quite well. Oh, the name of my blog, Just My Lack?